The versioning process of PHP has been exceptionally modified to clear the situation about the long-expected PHP 6. The last stable release, PHP 5.3.2, has been transformed in PHP 6 using the powerful Unix-based tool sed and finally released as PHP 6.0. The goals of this new major release are multiple: the first is simply to set in stone, once and for all, the features included in PHP 6, regarding for example the Unicode implementation. To avoid conflicts within the development team, which were dividing the volunteers in groups that advocated different solutions, the encoding used to store string will be the UTF-1, where the 1 stands for 1K, the size of the standard bitmap-based characther glyphs which are strung together to compose the source code of PHP 6 scripts. No more question marks (?) will be displayed due to character set issues, at least while reading PHP source code. The principal IDEs with PHP support, like Eclipse PDT and Zend Studio, have already announced the upgrade of their principal tools to simplify the editing process in the next days. This is probably the final death of the ugly old-style text editors like Vim which plagued the hardware vendors for years, delaying the adoption of new workstations needed to run the IDEs. Though, the selection of the font to use in the set of glyphs is being discussed in the developers mailing list, along with the standard size, which must be readable even by PHP developers with an imperfect sense of sight. A second, important objective is to finally give dignity to the large set of PHP 6 books released in the last three years . 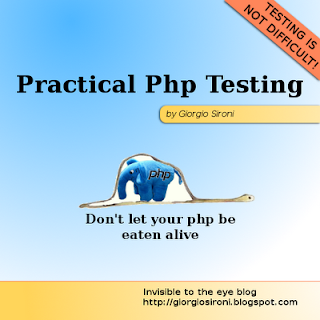 By re-releasing PHP 5.3 as PHP 6, there is finally the possibility of reading these books without wondering what PHP 6 is, or if the real release of PHP 6 has brought to the public different features from the one described in a Professional PHP 6 book. Now the books' publishers can state to have said the truth all the time about PHP 6 and its namespace and anonymous functions support, with the notable exclusion of the little transition from a character-oriented programming language to an image-oriented one. To give you a picture (no pun intended) of this radical solution that has solved the Unicode support and the blog posts syntax highligthing problems in a single shot, I will include here the source code for an hello world program written in PHP 6. 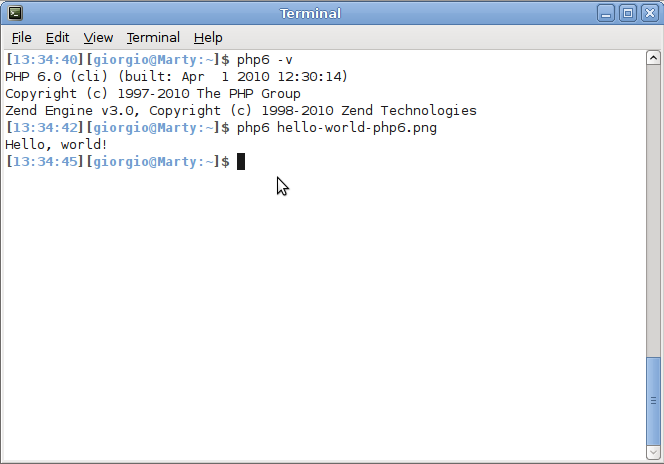 Save the file and run php6 hello-world-php6.png to see PHP 6 at work. Note that PHP 6 added a ! and a new line, which were inferred from my enthusiasm in building and running it. HAHA, that was pretty funny, especially the part about PHP inferring your enthusiasm. Great post. Thing is i just came across a book yesterday at Chapters (Indigo) entitled "PHP 6 + MySQL 5" and im like "... what?! Since when??" Usually when a book is about PHP 6 and it's not a scam, it talks about PHP 5.3 which was what the features planned for 6.x end up into. LoL..thought was it was real.